Are you looking for the best anti-aging facial serum that will help you maintain a youthful looking skin? Finding a great facial serum can be challenging due to the many serums available in the market today. But fret no more because the information below will surely help you find the right one for your facial needs. It can be difficult to find the right anti-aging facial serum since you need to ensure that it has the perfect balance of effectiveness and moisture. With the hundreds of products in the market today, purchasing one can be a problem. That is why I have gathered all the necessary information that you need for you to be able to choose the right anti-aging serum for your face. When choosing an anti-aging facial serum to help correct your spots, it would be best to choose something that has arbutin, ionic acid, licorice root extract, and vitamin C. The reason behind this is because having these ingredients in your serum will help lighten your skin tone. This means that the serum is not only helping your skin to look young, but it also helps in lightening the dark spots on your face. Now if you are looking for a serum that will help you deal with lines, then looking for peptides or retinol is ideal. The reason behind this is because both of these can assist the increase of collagen. An increase in collagen will help prevent lines and eventually fade the existing ones. You should take note that people who have sensitive skin might react to retinol differently since it can cause mild irritation to certain skin types. Now, if you have sensitive skin, then it would be best to choose a serum that is oil based, since it may cause little to no irritation at all. When the outer layer of the skin is off balance, the skin can get irritated and dry. That is why looking for a serum that contains humectant will help the skin to increase its production of hyaluronic acid naturally. Another ingredient that you need to check is the Glycerin, which is perfect for sensitive skin, as it will soothe the skin. A facial serum that has an antioxidant ingredient is ideal for people who are looking for ways to rejuvenate their skin. The reason behind this is because antioxidants can promote a beautiful and younger looking skin. Most of the serum for skin rejuvenation has alma berry, licorice root, and ova ours, which helps in providing a radiant, vibrant, and youthful looking skin. The serum can increase the skin’s hydration because of the elastin and collagen that it has. These two proteins are the most important things that your skin need to have a youthful complexion. The serum can help clear and heal your skin because of the vitamin C ingredient that it has. The antioxidant that it has will help alleviate the inflammation in your skin, which will contribute to reducing redness. The first thing that you need to do is to clean your face first before applying anything. If you need to exfoliate, then, by all means, do it. But if not then an exfoliator that is gentle will do since you need to make sure that your skin is free from dirt and oil. The next thing that you need to do is to start using a toner. It would be best to slightly damp the cotton ball with a toner on your face to clean and help with your pores. Once you are done with the toner, you can now start using the serum by patting it on your skin. Avoid rubbing the serum since it will only remove the product off of your skin, which you surely don’t want to happen. The last step would be applying a good moisturizer as this will help lock the facial serum on to your skin. But make sure that the serum is fully absorbed by the skin before applying the moisturizer. These are all of the information that you need to know about the anti-aging facial serum. Of course, it would be good to know the best anti-aging facial serum that is available on the market today. Clinique Smart Custom-Repair Serum is one of the best serums that can help eliminate pores and brown spots. It also can soften and make your skin firm. Clinique ensured that the skin could easily absorb their serum. Another good thing about this serum is that it can help brighten your skin no time. An increase of 24% is reported when it comes to the firmness of the skin. After a month of using Clinique, it has been indicated that there is a 7% improvement in both visibility of pores and brown spots. Some of the other things that this serum can do are to make your skin radiant and reduce the appearance of wrinkles and lines. Boots No7 Protect & Perfect Intense Advanced Serum comes at a very low price but works the same with the most expensive serums of today. It can smoothen the texture of the skin. One of the best things about the Advanced Serum is that it is lightweight. This means that you can apply this together with your other facial regimes. Advanced Serum can help reduce wrinkles and can help you look younger. Another good thing about this serum is that is can provide results in as fast as two weeks. The reason behind this is because it is re-engineered to provide you with the best results when it comes to anti-aging serums. It is also powered by the Matrixyl 3000 Plus, which helps in maintaining youthful skin. SkinCeuticals Metacell Renewal B3 has proven to reduce the appearance of wrinkles and lines. In fact, it can instantly provide plumpness on your skin the next day. One of the best things that this facial serum can do is its ability to correct photoaging. Redness and other discoloration are also reduced upon regular use of SkinCeuticals. The SkinCeuticals’ B3 uses an inverse aqueous to ensure that it will provide a high concentration of 2.5%tightening tri-peptide, 5% niacinamide, and 15% glycerin. It is considered as an everyday moisturizer, which will correct the early appearance of photoaging. This serum can also help even skin tone, elasticity, and lessen the wrinkles. Murad Retinol Youth Renewal Serum is formulated with retinoids that can help increase the elasticity of the skin over time. It is lightweight and has a fragrant smell, which won’t cause harm to the skin. This serum can help brighten the skin, by reducing the brown spots. It can also reduce the appearance of wrinkles. Murad serum is powered by Retinol Tri-Active, which is a fast acting serum, a retinol booster, and a quick release retinol. It can quickly and gently minimize the appearance of deep wrinkles and lines. Murad can also help even skin tone while firming it. Lastly, it has a hyaluronic acid spheres that can attract the moisture deep into the face to provide and smoother and plumper skin. TruSkin Naturals Vitamin C Serum for Face is a powerful anti-aging serum. It helps reduce the appearance of fine lines and wrinkles, while helping boost the collagen, fade age spots and sun. It can also help in skin firming while brightening the face to ensure a fresher and smoother look. TruSkin is formulated with nothing but the best types of ingredients. This means that it can provide you with the results that you’re looking for. Another good thing about TruSkin is that it can help reduce acne scars. This will surely leave the skin healthy looking. It can also contribute to shrinking the pores while preventing breakouts. The anti-aging properties that this serum is the reason why more and more people trust this brand. These are all of the top 5 best anti-aging facial serum to choose from. 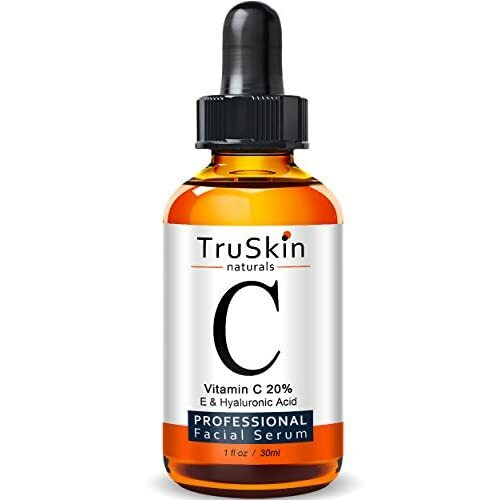 For this review, TruSkin Naturals Vitamin C Serum for Face takes the spotlight not only because of the vitamin C content that it has. But because of how it can reduce not only the wrinkles but as well as clear acnes. It also has powerful anti-aging properties, which makes it an effective anti-aging serum. Dermavie Reviews – Does it Knock The Years off?